Something about the autumn crispness that awakens cravings for casseroles and pies. Warm subtle sweetness from sautéed red onions blended with the tender nuggets of chicken lightly coated in chopped tarragon and sage. Broccoli brings a colorful balance with healthy vitamins to this dish, but any fresh in-season vegetable is suitable for the recipe. All surrounded in a light creamy sauce with a touch of white wine (optional) and topped with a crumble of garlic and herb croutons. Feel free to adapt it by including your favorite ingredients (shallots instead of onion? zucchini instead of broccoli? top with grated cheese?). This dish was my entry in the 2010 Chef Factor competition hosted by Cully & Sully. 2. In a small pan, sauté the sliced onions in olive oil and chicken broth on low until they are sweet smelling and nearly translucent. Leave to cook while preparing the other elements. 3. Cut up chicken breasts into bite sized pieces, season with pepper, tarragon, and garlic salt. Sauté chicken in a little olive oil over medium-high heat in a large pan then partway through add the [optional] white wine and cover and cook until the chicken starts to brown. Stir in the cooked vegetables and contents of the onion pan. 4. Spoon the chicken/onion/vegetable mix into the baking dish. 5. In the chicken pan, warm the mascarpone cheese, whisking and adding a little whole milk to liquify into a sauce. Continue to stir for a couple minutes then pour over the contents of the baking dish. 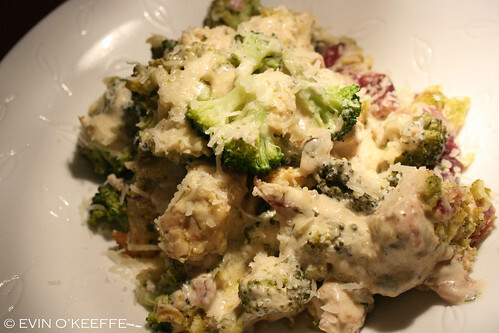 Cover with crushed croutons and [optional] parmesan cheese then aluminum foil and bake. 6. After 20 minutes, remove the foil and let cook uncovered for 5 minutes to lightly brown the crumble top. 7. Serve hot with buttery long grain rice or a loaf of fresh baked bread. This entry was posted in Lunch | Dinner and tagged Baking.